Our beloved Captain Cannon has just arrived back from a space mission where he was forced to use a shrink beam on himself. After sitting for just a few minutes behind his desk, he notices a farm which appears to be ruined. He takes his helicopter and starts to investigate the place, but the farm doesn't really seems what it looks like. I would like to thank Blikjebier, MitaMan, TraK and Method for their textures. - None, report so if you find any. - Make the story line match the play. - Some textureblending on top of the mountains so snow can be located (like on the skybox). - Add more details to make it really look left behind. - Finish the end of the map. 17 - 23 June 2013: Further layouting, adding more accurate shapes and such. 24 - 30 June 2013: Same but with low priority. Nearly done creating the core layout and halfway done the finer layout. 1 - 7 July 2013: Arranged the map's cfg-file. 8 - 14 July 2013: Holiday. 15 - 21 July 2013: Customized models. 22 - 28 July 2013: Textured and lighted the house. 29 - 11 August 2013: Detailed the outside of the house. 26 August - 1 September 2013: Added details inside both buildings. 2 - 8 September 2013: Added a well outside, made progress with the mountains. 9 - 15 September 2013: Started adding mapmodels inside the buildings. 16 - 22 September 2013: Started blendmapping, (nearly) finished the mountains. 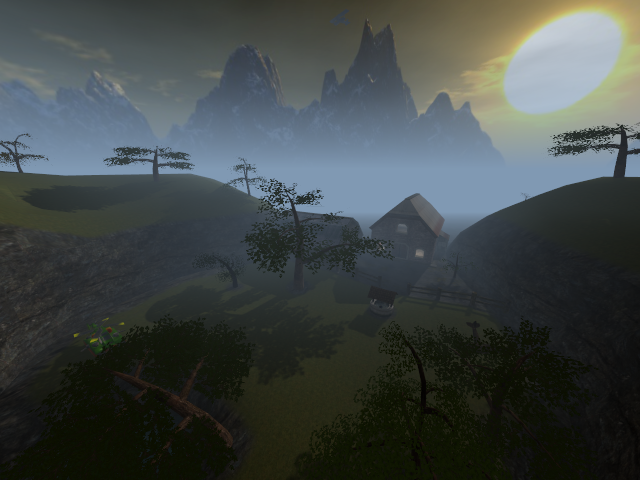 23 - 29 September 2013: Finished blendmapping, added vegetation models outside, added mapsounds. Tried out some scripting. 30 September 2013: Packaged all necassery content to make it "work". There is still a lot of repackaging to do (as like deleting unnecessary files). I'm pretty sure the total file-size can be reduced towards 30Mb (it was a total of 85Mb before actually packaging). I'll release a better (bug-fixed?) version of the map tomorrow (just doing so just in case actually). 1 October 2013: Re-uploaded the zip-file (with a working single player story line), all bugs should be fixed. Chopped off 9Mb of the file-size as well. 2 - 6 October 2013: Bug fixing. The end should be more logical now (as nearly a real end). Added a (so far unlogical) secret within the map. Managed to clean up the zip-file some more, it's less than 29Mb now. Idk what it mean but it work fine. Also i get some texture errors. Need that someone check it too. Maybe only i have this problem. When i try to play this it doesnt load the cfg and the maps looks really funny with wine bottles instead of trees. Well, fixed the texture and model bugs (don't try to clean up models/textures which are called by the exec command, they mess up badly). I couldn't reproduce the 1) world trigger bug so can't fix it. It should indeed be harder than other maps (as compensation for being short). My intention was to make an underground part for the map as well, but that didn't made it due the lack of time. Perhaps I'll make it some day. I guess you had the same problem as TristamK, although winebottles aren't used in my map (neither described in the map's cfg). So I my best guess is you've tried to load scesp1.ogz (which I accidently left inside the package last time I checked), instead of mystic_farm.ogz. Nothing really wrong with this map, but I voted 8 of 10 because Meltdown is just far and away the best map of the challenge. This map was unexpectedly short, but that doesn't really matter, because all of it looks nice. The only puzzling thing is why you need to get a key to the house at all when you can easily jump in the windows on either side of the door. I enjoyed playing this map! :D Even if it's very short it has a lot of atmosphere & horse :D Wish there was something beyond that portal though! Maybe you make a full fledged sp episode out of this someday? I would love to play it! because with skur's map its the only map which is in a playable state. This first part of the map is a bit tricky but definitely not to hard (my highscore: 197 :p). So I would like it if you expand your map in the future. Ah and it took me awhile to realize that your Quad Damage is a fake. :) I voted 8 points for it, but only because of the length it's not 10. This map has a great atmosphere and excellent texturing. It's my #1 in the contest, because it, as the only playble map aside from my own one, gives the best singleplayer experience right now at the end of the voting period. Sadly it is still very small and doesn't seem quite finished, since it doesn't really have an ending and a lot of other stuff looks rather incomplete. And even though I see a lot of potential in this map, I can't give you more than 7 points for this, because it, at it's current state, is so small and lacks a proper storyline and script. I'm looking forward to future updates and will be highering my rating accordingly. If you manage to turn this into a full sized Singleplayer map, keeping up that quality of texturing and geometry, it could esily get a 10/10!